Confession. The hardest part of marriage so far has had to do with ME. The day after we returned from our Mini-Moon, I instinctively went into my “ideal" of what being a "wife” was. I became crazed in responsibilities around our home. I ended up overwhelmed, and quickly burned myself out. I eventually learned that I had become crazed in my own expectations of myself. Taylor and I hadn’t really ever discussed expectations of responsibilities, because we hadn’t even thought of addressing it. The day we came home from our mini-moon (you can learn more about that HERE) was the first time we began living together! So exciting, and something we had obviously both been looking forward to for a long time. But because we didn’t head out on our honeymoon until about a month after our wedding, we basically had the weekend of our wedding to live in the bubble of wedded bliss. And then the following week, we jumped straight into the daily grind. Both of us back to work, and our new daily norms just started to take shape. But here’s the thing, I’m no superhero, not even close. However, I am convinced that several of you out there ARE superhero's, and maybe someday I'll get there!! But I ended up falling behind in my work, and like I mentioned at the beginning, I became so overwhelmed! I was joyfully taking on these tasks, but I still had other responsibilities, and ones that helped pay the bills, so I needed to figure it out. Everything actually clicked one day as I made a confession on my Instagram story. I confessed on my story that I basically had an emotional meltdown trying to figure out what to make for dinner, because I just wanted to be sure that Taylor was going to love it. (P.S. He has never not loved what I’ve made… yet, anyways. ) I personally think that choosing what to create for someone else is a big decision, and I’m indecisive enough! haha! But all of you out there, on the other side of my Instagram story told me that I was experiencing normal new pressures of being a newlywed. I realized I wasn’t alone. And this reminded me of grace. 1. Sharing Responsibilities. Taylor was actually the first to approach this. The evening I shared on my Instagram story and realized that I had placed these pressures on myself, I shed a few tears to Taylor. Right away, he reminded me that he had never had expectations of me taking care of all of these tasks. He sees how hard I work, and how much I love my work. He helped me break down the standards I had created for myself, and reminded me that we’re a team. He also reminded me of how much he loves to cook too, and that it’s one of our fav past times to do together. He wanted to help with household responsibilities, and he hadn't ever had expectations of me carrying all of that on my own. So now we're sharing tasks, and I have let go of expectations (most of the time) on how much I can tackle on my own. 2. Green Chef! Hellooooo Meal Kit Delivery Service!! An answer to prayers, and answer to my tears over “what should I make for dinner” decisions. 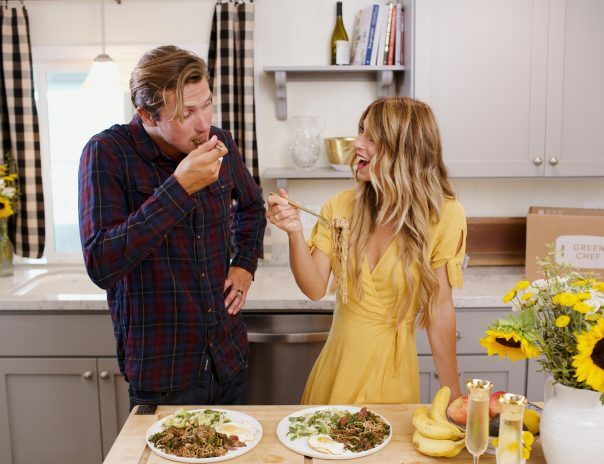 Before we got married, I had been using Hello Fresh, we would cook meals together every couple of weeks, but once the wedding came and went, and all subscriptions placed on pause as we settled into our new life, we kinda forgot about how helpful this was. So as we began exploring this again, I found out that Hello Fresh had added Green Chef into their family! Green Chef has plenty of options for all different dietary preferences including: Paleo, Gluten Free, Keto, Vegan, Omnivore, Vegetarian! They’re also a USDA Certified Organic Company, and work with farmers to source sustainable and delicious ingredients. I have to be Gluten Free, and I also prefer to be Grain Free, so we order from the Paleo and Gluten Free menu’s! -Not having to plan ahead for what you’re going to cook. Someone else did it for you. -You feel like a fancy chef at the end!! haha! The meals are quick and the creativity behind the combinations has opened my mind up to even more ways to use ingredients and create a meal! 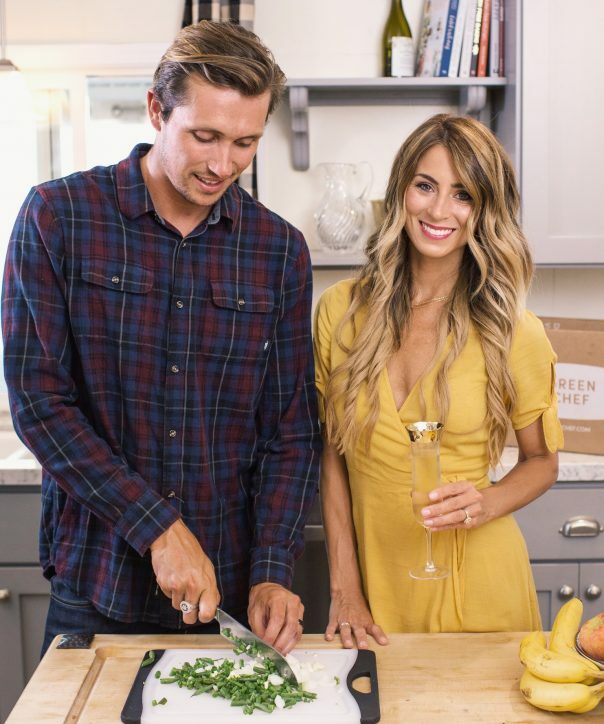 Taylor and I receive 3 meals at a time, and it’s perfect for the nights we can cook dinner together, we turn some music on, pour some wine, and cook. It also makes it one of us needs to tackle dinner on our own one night. Taylor actually loves to put these meals together!! 3. Letting things go, and lower Expectations of Myself! I'm also learning to give myself a whole lot more grace in this area. Like I mentioned, these tasks, and even being in a stage of life to be creating our home, truly bring me great joy, so i still love adding items like laundry, cleaning, shopping, and cooking to my to do list.  I enjoy these things… when I have time. The hardest part of marriage so far has been me, myself, and I! But let me tell you about the best part… my husband. I love that he sees me as his partner and that he wants approach life with me as his teammate. I love when he walks through the door at the end of the day, and within greeting one another, when I find myself starting to explain that I was too busy to do the dishes… I can stop myself knowing that he loves me and appreciates all that I did within the day without any explanation. Now your turn, I want to hear your stories from that Newlywed phase of life! *This blog was written in partnership with Green Chef, but all of my own thoughts and opinions! I can relate to this on many levels. 1. When we returned from our wedding at the beach it was the first time my now husband had ever stayed at my house. I had lived a lone for a long time and suddenly someone was now going to occupy my home with me. I literally had a panic attack the night we got home. There are no words to truly describe the moment I realized he was never leaving. Lol! I will say that we have laughed about that night and those courts few weeks of adjustment many times and I’m pretty sure it has been the humorous topic of discussion among friends at dinner. I will never forget that overwhelmed feeling I had. Whew! 2. We became parents overnight to our boys who were 2 and 7 and that took it to a whole new level. We were suddenly juggling our full time jobs and our two boys and everything that related to that situation at the time. I had never cooked for a family and I didn’t have that type of family situation growing up so I was overwhelmed with responsibilities and figuring out how to juggle everything. I felt like a failure even though o was trying my best. Thank goodness I have a gracious and loving husband who also knows how to cook. Either way, figuring out meal planning and schedules and how to do it all took a toll. Haley, Thank you sooo much for sharing. You truly did have some overnight changes! But yes, that time in the morning with Jesus is key. And thank goodness for grace, as we’re all a work in progress. 😉 Thank you for sharing this. xo! oops. Just realized I spelled your name wrong, I’m sorry Halley! Also, here’s the link for Green chef: HERE, they do have a family plan for more mouths to feed! I’ve been married to my husband for almost 20 years (second husband). We share our responsibilities. If I cook, he cleans up or vise versa. He helps clean, do laundry, and both do yard work. I use to be like you about everything being in order. I have learned over the last year that everything doesn’t have to always be done. It will still be there the next day. Marriage is 50/50. It take a lot of work. I hope y’all have many years of love and happiness. Congratulations on 20 years!! Thank you for sharing Katie! xo! This post resonated with me so much. So beautifully worded. I have come to learn that I don’t have to be super-wife. My husband is perfectly happy sharing in the responsibilities. While I do enjoy cooking, that is one thing he is very good at and is happy to take over dinner prep. I am SO appreciative that he does. Out biggest struggle has been finding meals that please us both – I am a vegetarian and he is quite the opposite. Kara, thank you so much for sharing. I’m sure you’re a super wife as is!! I love that your husband is willing to share responsibilities as well!